Could you tell us a bit about your background as it pertains to Hamtramck? I was born in Hamtramck in 1950 at St. Francis Hospital, which is now the building used as City Hall. I went to school at St. Florian for 12 years and then went to Wayne State University and got a degree in journalism. I spent the last forty-some years in journalism as editor of newspapers, magazines, written books. I used to be editor of The Citizen, which was the local newspaper back in the 1970s and early 80s. I edited the Birmingham Eccentric newspaper and a whole bunch of other publications. Yet, I have always been a resident of Hamtramck and I love living here. In 1998, the city formed a historical commission. At the first meeting, I became chairman because nobody else wanted to be (laughs) Literally (laughs). So I ended up being chairman and I still am today, though that will be coming to an end at some point because we want to bring in other people too. Along the way, we formed the Friends of Historical Hamtramck which is a non-profit organization, and it was through the Friends that we eventually established the Museum here. 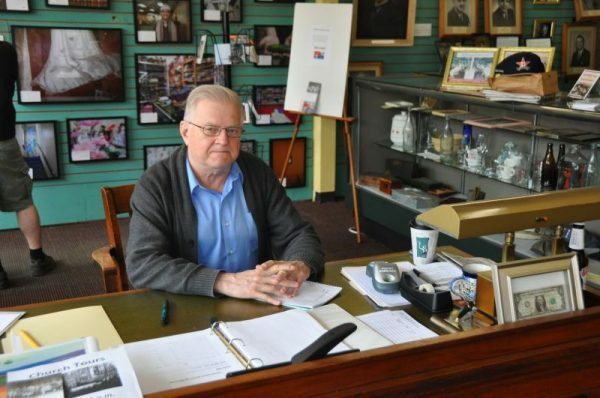 What is your role at the Hamtramck Historical Museum? I am one of the directors. We are a seven-member board, and we are the seven members who comprise the Hamtramck Historical Commission. We also make up the board of directors of the Friends which is the organization that technically owns this building and everything in it. What is it that you enjoy most about Hamtramck? I enjoy the vitality of the place. It’s an incredible place. If you really get involved in it you can find a lot of great things here. I love the diversity here – I think it’s tremendous. It’s really cool and I very much enjoy that. It’s just a very lively place and that’s something that I really like. You’ve always got something going on here. We have the Art Festival and other activities coming up as well. What does the Museum aim to show viewers? What are some of the most notable pieces on display? It is important to understand that we are not a Polish museum. We are a historical museum. What we’re trying to do is preserve and present the history of Hamtramck to everybody who comes here: our visitors, our residents, and our former residents. We are not just a static building either. We don’t believe in just having things on display and in cabinets. That’s nice but the heart of our organization are the programs that we do. We have a history program, a dinner program that we do every month, a trivia program, and much more. Earlier this year, we had a big exhibit with the emigration museum in Gdynia, Poland. So, we are very active. We like to bring people in here and get kids involved with the things we have going on. We’ve done a lot of work with the University of Michigan, Wayne State University, and The College for Creative Studies. Where did the idea of a historical museum come from? Well, Hamtramck has an incredible history – much better than most cities – and we’ve never had a museum here. That was always a point of contention for us. When we started the Historical Commission, we made it our number one priority to get a museum. Now, opening a museum is an incredibly difficult experience. It’s really hard. People cannot believe what we went through to get this place open. There are a lot of technicalities to it. It’s a nightmare financially as well because you have to deal with the IRS, the city, and the State of Michigan. You need to get licenses, insurance, and all kinds of other things. We got this building, but we’ve spent the last three years renovating it and we are far from being done. How do you envision the future of the Museum? We want it to be more multicultural because, by default, it’s mainly Polish given modern Hamtramck history. That’s only changing now, so we are reaching out to other communities. We want to get different nationalities in here as well as we continue onward because we need to have a sustaining operation here. We’d also like to expand the Museum as well. We’d like to use the upper level of this building because it’s fabulous. It’s a wide-open space that we currently use for archiving and storage. There are also these incredible windows in the front that stretch from the floor to the ceiling. We’d also like to open the basement up. That is where we would love to do programming. Believe it or not, the basement has a tin ceiling, which is also very nice. Eventually we plan on opening all of it up. The displays are a testament to the town’s evolution and ever-changing culture. How do you imagine Hamtramck in the future? It’s never going to be dominated by one ethnic group. It’s going to be a multicultural experience here from now on because we’re not just seeing one group moving here. There are a lot of Bangladeshis, Yemenis, African Americans, Filipinos, and others from all over the world moving here. There are a lot young people moving here too from midtown and Corktown because they’re getting priced out and this is where they’re coming. Honestly, we’re just about full here in Hamtramck. It’s hard to even get a rental here these days. So, we can expect more of a mix of everything which is one of Hamtramck’s strengths. That is going to be very good. I actually see Hamtramck’s future as being very bright. I really do. What are the reactions of visitors to the museum? Well, we do a lot of tours of the city in addition to having the museum, so there are different reactions from both groups of visitors. We have a lot of people coming here from all over. They come from Cleveland, Toledo, Port Huron, Livonia, Farmington Hills, Sterling Heights, and other places. The people who come to the museum will usually see something and say, “Oh my goodness, I remember that,” and they haven’t thought of that in thirty, forty, fifty years. All of a sudden something brings a memory back to them. That’s the most common reaction you get from people who visit the museum. The most common reaction you get from people who come to tour the city is “I didn’t know that.” They are really shocked at what they see. They have an impression of Hamtramck, and when they come here, they find out their impression is usually totally wrong. This is a livelier and nicer city than they expected. This has become a real destination spot for people. There are a lot of people who will come and spend the entire day here. We’ve even had to do 6-hour tours because people have wanted to get the whole experience. If you could go back in time, which decade would you choose to live in Hamtramck and why? It’s funny that you bring that up because we’ve talked about this a number of times. First of all, none of us would want to go back in time and live there. It was not what people think it is. People remember the good old days, but in reality they weren’t that good. I read the old newspapers and you would not want the things that were happening back then. However, I would love to observe. I would first go back to 1890 when we were still a little farming village. Then, I would love to go back to 1910 to see where the Dodge brothers opened their plant. Then, to 1920 when Hamtramck turned into this industrial powerhouse. We went from 3,500 people to 48,000 in a space of 10 years. We were the fastest growing town in America. The government did a special census on us because they wanted to know what’s going on too. They found that we were growing at a rate fifty times faster than the rest of the country. It was incredible. And the city covers only 2 square miles. So, I would love to see that. How does the Museum sustain itself financially? How can readers support the Museum? [Pulls out a donation jar] That’s one key way. We are totally self-sustained and we do not get any money from the city or any other organization. We do apply for grants. We got a $10,000 grant from General Motors and we’ve gotten other grants as well. We also have membership in the Friends organization which is a primary source too. We manage to keep our costs here at extremely low levels. So, we’re able to operate with minimal financing. We are all volunteers. Most of the work we do or have done here is volunteer work, and we have volunteers who work on the building as well. We’ve been able to keep our expenses low. Our primary expenses are heating and electricity. In fact, we just got two new furnaces put in to help deal with those because they were $1,000 a month at one point. We’re going to restore the tin ceiling here, paint the walls, and put in a new floor. We’re having galleries installed too. Thank you for your time and very interesting conversation. After the interview, Mr. Kowalski was kind enough to give me a tour of the Museum and tell me about some of the most interesting pieces that can be found there. He says that only about 1/50th of the items the Museum has acquired are on display while renovations are still going on. One cannot help but notice that a majority of the artifacts have been excellently preserved, making it hard to believe that some of them are over a century old. It is also important to note that all of the artifacts were donated, and new pieces are being donated almost every day. Visitors to the Hamtramck Historical Museum are sure to find something that will be of particular interest to them. Those who seek to learn more of the city’s industrial past will find physical remains of the Dodge plant such as bricks and firebox doors as well as photographs of the various businesses that sprung up throughout Hamtramck’s rich history. Visitors who want to reminisce about their academic experiences in Hamtramck’s schools will find desks, uniforms, and class portraits from decades past. Cinephiles can learn about Hamtramck’s renowned actors and movie producers such as Tom Tyler and Gail Kobe through the movie posters and films on display. Finally, visitors can get a sense of what it was like for immigrants to make the journey from Europe by viewing the stacks of labeled luggage trunks and well-kept naturalization papers. These are just a few of the many remarkable artifacts that can be found at the Hamtramck Historical Museum. 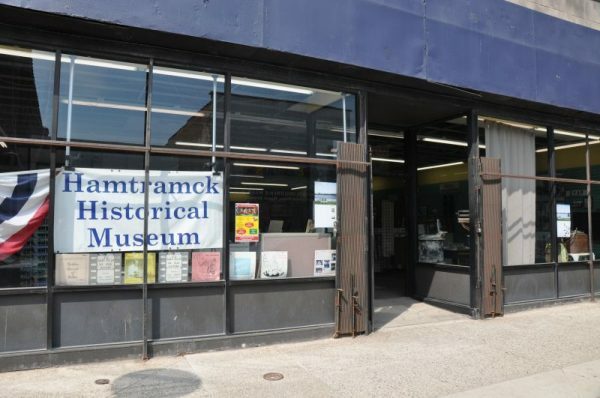 The Hamtramck Historical Museum is open on Saturdays and Sundays from 11 a.m. – 4 p.m. The Museum is located at 9525 Joseph Campau Ave.